There were a few more sweet potatoes and strawberries in this box when it arrived. My youngest got the strawberries, and I shared the purple sweet potatoes with my MIL. The woman is a saint. She took the kids on a day when I couldn't lift my head off the pillow. If I didn't have a stomach bug I would have encased them in solid gold first. I also bought a pound of lovely asparagus, but since I paid extra for them I didn't include them in the photo. Now that I'm starting to feel better I suppose I should do something more than watch He Loves Me, He Loves Me Not on Netflix and nibble on granola. And so last night I worked up enough energy to roast some of the asparagus and sweet potatoes and make a simple mayo on the side. 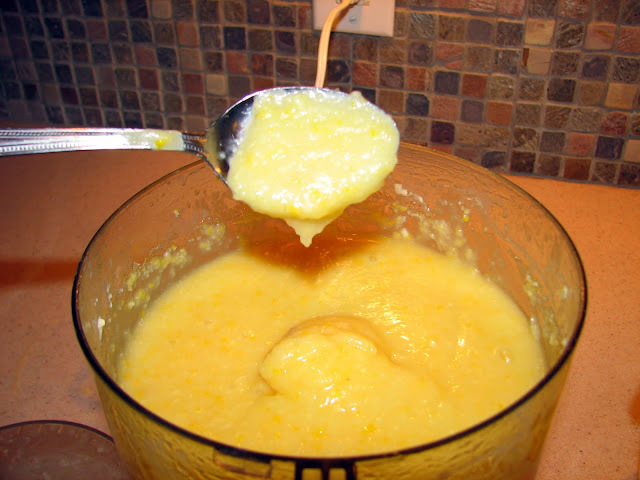 At first I wanted to try a homemade mayonnaise from Michael Ruhlman's book Ratio (more on that later), but the idea of eating raw egg yolks after so close a bought of illness made me change my mind. I'm also not keen on feeding the little ones raw egg just yet. I'll wait until we start our mommy-and-me muscle building classes in the fall. Joking. Mayonnaise turned out to be the perfect side to turn healthy roasted vegetables and leftover grilled chicken kebobs into a heavenly, calorie-rich meal. I suppose you could also use low-fat mayonnaise or a light version but my husband can smell it a mile away. He loved this mayo, however, and so did my youngest. My oldest boy sniffed it and rotated his plate until it was on the side opposite of him. You win some, you give some his favorite Italian dressing and call it a victory when he licks a sweet potato. 1.) Place Mayo, lemon juice, garlic and herbs in a food processor and blend until semi-smooth or at least until there aren't any chunks of garlic. If you don't have a little food processor like this one, then finely chop the garlic and herbs and blend together by hand. 2.) Let sit in the fridge while the veggies cook. 3.) Heat the oven to 400'. Line a pan with parchment paper or with foil and a light coat of oil. 4.) Rinse your asparagus and pat them dry. Lay them out on the pan and drizzle lightly with olive oil. Season with salt and pepper. 5.) Place your sweet potato pieces in a zip-locked bag with 1 Tb olive oil and salt and pepper to taste. Shake until coated. Pour the sweet potatoes out on the pan next to the asparagus. 6.) Place the vegetables into the oven and bake until done, 20-25 minutes. The asparagus will finish first around 15 minutes. Take them out with a pair of tongs and set them aside while the sweet potatoes finish cooking. The sweet potatoes are done when you can pierce them easily with a fork or they're tender to bite into. 7.) Arrange the veggies on a plate with your main dish and a dollop of the mayonnaise. This is the savory version of strawberries and whipped cream, so enjoy! Our second Produce Box arrived this week with bok choy, romaine lettuce, English cucumbers, hothouse tomatoes, garlic scallions and strawberries. 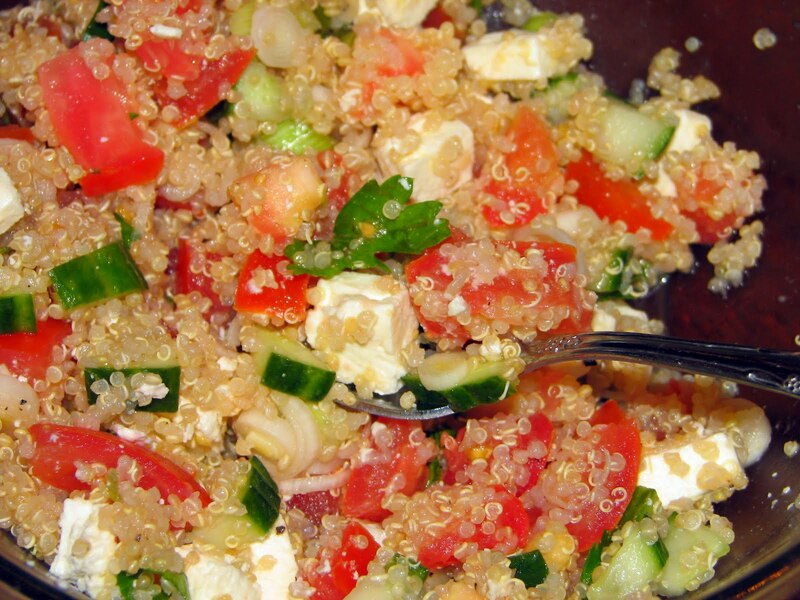 This Summer Quinoa salad makes use of the cucumbers, tomatoes and garlic scallions. Serve it as a side salad for dinner and use leftovers for lunch the next day. If you've never heard of quinoa, it's somewhere between a rice and couscous in texture but packs amounts of protein and amino acids the others can't touch. Cooked quinoa also doesn't absorb the salad's dressing as quickly as rice or pasta would, so you don't have to use as much to have an impact (read: fewer calories). It will keep in the fridge for two to three days, covered. If you use fresh basil, be aware that the basil's leaves will brown over time. 1.) In a small bowl, whisk the olive oil, vinegar and salt and pepper until combined. 2.) In a separate bowl, gently toss the quinoa, tomatoes, cucumbers, garlic scallions and herbs together. 3.) Add the dressing to the quinoa mix and toss to combine. 4.) Add the chopped feta and toss just until combined. You don't want stir it so much that the feta disintegrates and turns to mush. Keep the feta in nice chunks for a better texture. It's also great without the feta. My oldest son is out of preschool all week for Easter break, so we're doing one special, fun thing each day. Tuesday night we decided to give our first camp-out in the backyard a try. I grew up camping, but I have since discovered the wonder of hotels. My idea of 'camping' now involves a 30-foot long Winnebago with hot water and a stove to cook on. But with two boys and a husband who's a former Boy Scout I'm outnumbered. Don't get me wrong; I'm not a super girly-girl. I love outdoor adventures. But I also like sleep and a hot shower after a full day of sweating and a meal I don't have to scrape from the cast iron skillet in the stream afterward. And I usually end up with a rash or allergic reaction to something. Okay, I may be a little bit of a wimp. Daddy: Go night night Baby. Baby: (Pauses as if considering this perfectly reasonable request.) No. Mommy: You probably ate too many s'mores. Oldest: But I only had five! Mommy: Maybe five was too many. Mommy: Go to sleep, Honey. Oldest: I don't feel safe in a tent. I think we should move it. We're going to slide down the hill. Mommy: We're not anywhere near the hill. Go to sleep. Oldest: I think I want to sleep in my bed. There might have been the teensiest bit of sighing through this exchange on my part. By 9:30 p.m. both boys were tucked safely in their beds. They were asleep by 9:35 p.m. Mom and Dad followed suit by 10:30 p.m. The next morning my oldest said he missed camping out and wanted to try again. My husband and I talked about taking the kids to the mountains where we can wear them out hiking and swimming first, then try camping. But really I'm thinking there's a Winnebago somewhere with my name on it. 1.) 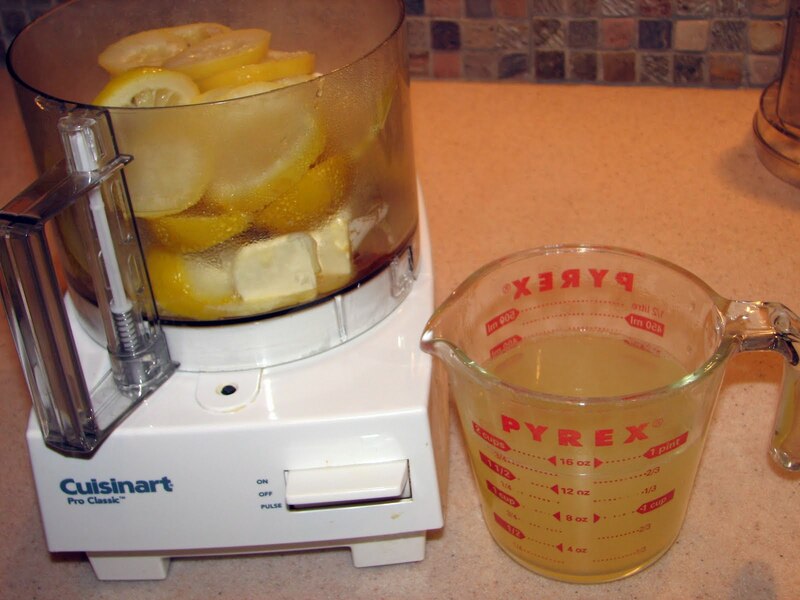 Squeeze the lemon juice into a small bowl. Add chopped garlic and herbs, salt and pepper. Whisk in olive oil. 2.) Place thawed chicken breasts in a shallow bowl. Add marinade and toss to coat. 3.) Marinate an hour or more, turning once. 5.) Top with some crumbled feta cheese and capers or chopped olives if desired. I garnished mine with rosemary. 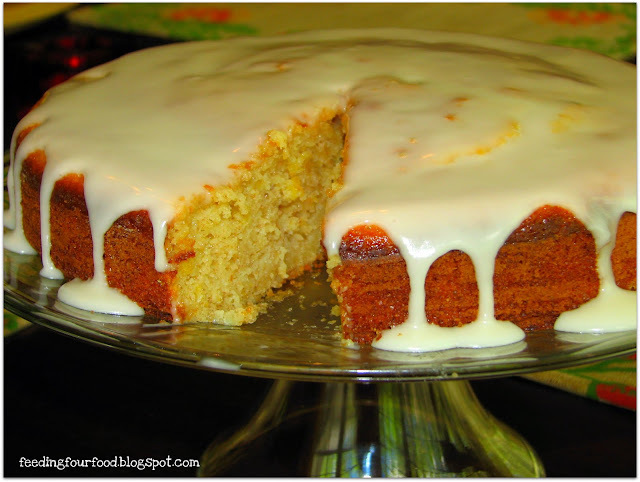 So I was excited to see a recipe for "Simple Lemon Cake" in this month's issue of Everyday Food that made use of four whole lemons. Wow, right up my alley. I read the recipe over and thought it sounded a little involved but wanted to give it a whirl. I'm glad I did. After quite a bit of tweaking and the addition of a glaze, it came out delicious. Dense, moist crumb studded with bright yellow lemon peel and a tangy glaze that balances the bitter/sour of the lemon peel in the cake. Wow. There's something old fashioned and Depression-era about boiling down the lemons and pureeing them to use in the cake. A revelation--well to me anyway. But what a lot of work to get there due to a poorly constructed recipe and a few of my own gaffs. I could go on for four more paragraphs about all that was wrong with the magazine's version of this recipe (which I did in an earlier version of this post and then decided just sounded too cranky). Instead, I will post the ingredients for the cake in a more logical order and with all the changes I made. I also included the recipe for the glaze I added. For the original version of the recipe, check out this month's issue of Everyday Food. 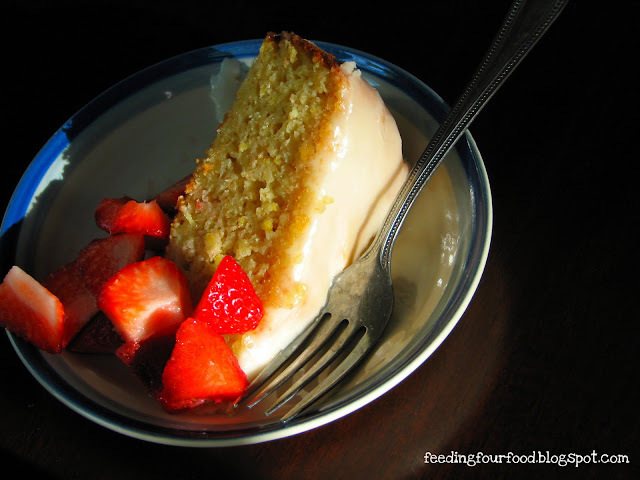 Serve this alone or with fresh strawberries and whipped cream. 1.) 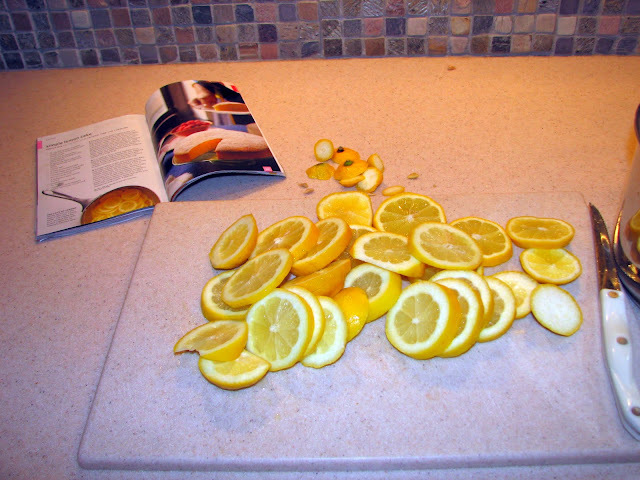 Slice the lemons, removing the ends and picking out any large seeds. Not sure if this is necessary with the seeds but I worried it would effect the taste/texture of the final puree. Better safe than sorry. There's no way to make the crunch of seeds appetizing in a cake. Plus it seems like the seeds would make it unnecessarily bitter. 2.) 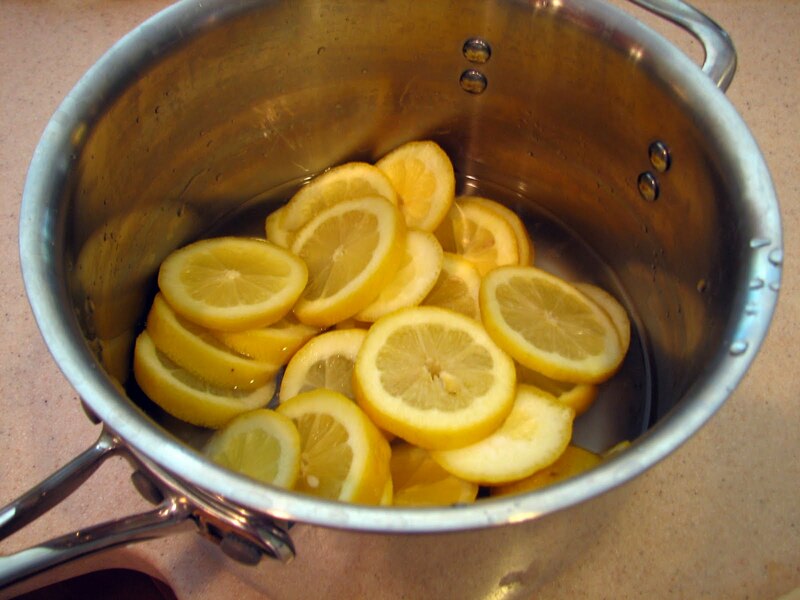 Boil the lemons in water and a pinch of salt, 15 minutes, or until soft. 3.) Drain the liquid and set it aside for use in the glaze and to make lemonade. 5.) In a separate bowl mix the flour, salt, baking soda and powder. 6.) 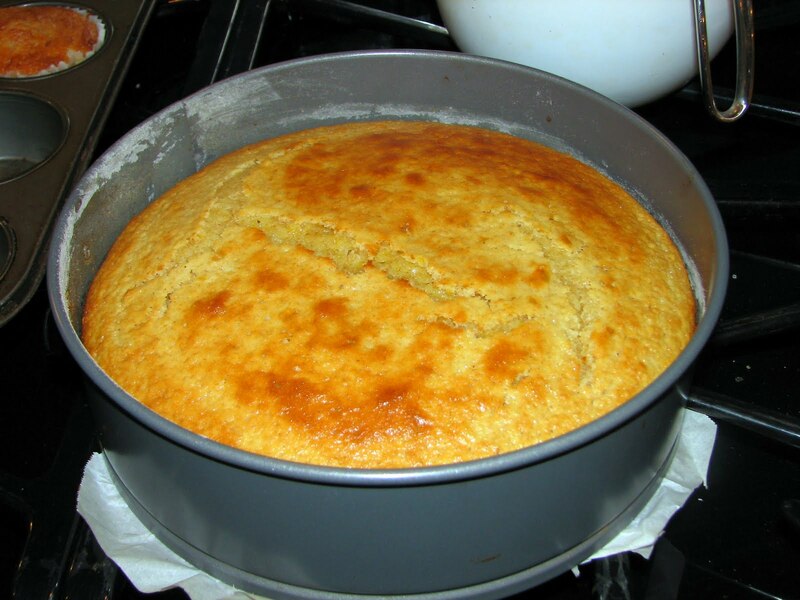 Add lemon mix to flour mix alternating with milk or kefir. Beat just until smooth. 7.) Now here I got annoyed because the original recipe claimed to make enough batter for one 9" cake pan. But I filled a small spring form pan 3/4 of the way and poured out six more cupcakes. You can probably get two 9" cake pans out of this or try a bundt pan. 8.) 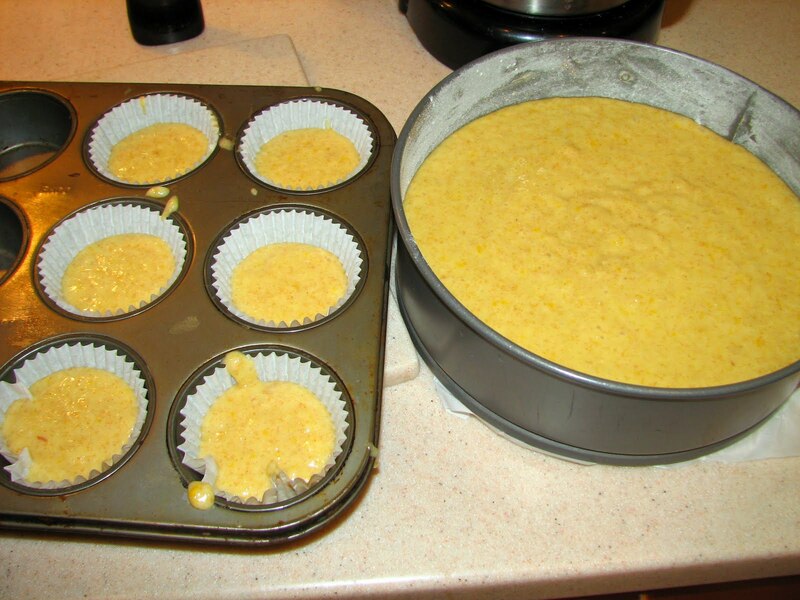 Bake the cupcakes (if you make them) for 15-18 minutes and the cake for about 35-40 minutes. Let cool on a wire rack. Remove from pan. 1.) Place 1 cup confectioner's sugar in a bowl. 2.) Whisk in 1 tsp vanilla and the lemon solution 1 Tb at a time. I used 2 1/2 Tbs for my glaze. I didn't glaze the cupcakes, so if you want enough glaze for them as well, double this recipe. 3.) Prick the cake all over with a clean fork. 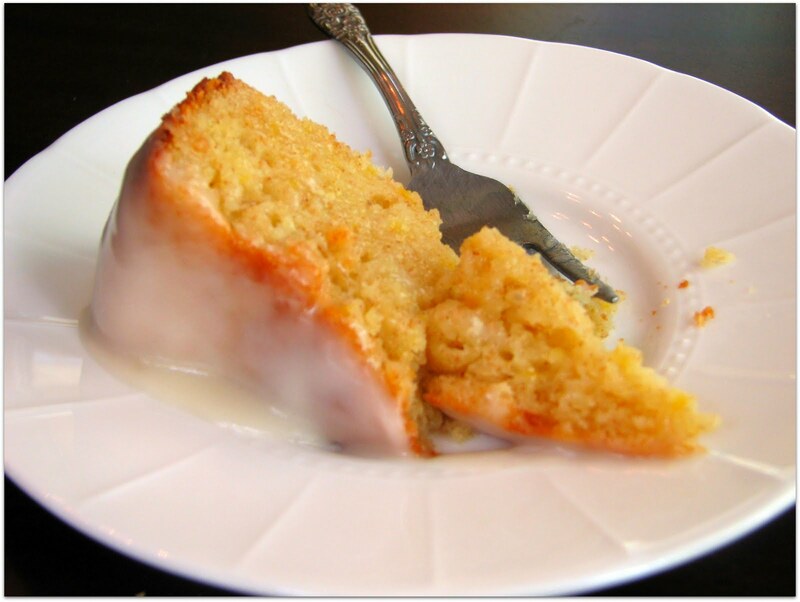 Spread the glaze across the top of the cake, using the back of a spoon, until the glaze spills over the edge. Serve warm or cool. This salad is so easy I'm not going to post an actual recipe. I used three of the hothouse tomatoes and two of the spring garlic bulbs (use shallots or scallions if you don't have them) from my box and a small fistful of assorted fresh herbs from my garden (basil, parsley, oregano and rosemary). Chop the tomatoes and slice the garlic. Toss in a bowl with a sprinkling of red wine vinegar, a splash of olive oil, a pinch of salt and fresh ground pepper. 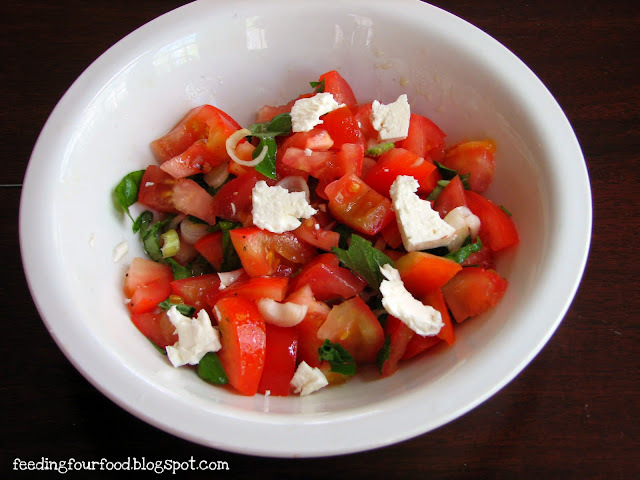 Top with crumbled chunks of feta or mozzarella. If the tomatoes are too tart or you overdo it with the vinegar, add a tiny sprinkle of sugar. Let marinate in the fridge for an hour or so and serve chilled. Mmmmm... I love spring. So the curtains are in, ironed and hung (thanks to Rich!). After all the agonizing I decided to stick with a solid color so I could mix things up with the table linens...that I will theoretically one day own. The drapes, which were surprisingly affordable for fully lined drapes, are from jcpenney.com and the hardware is from Target. 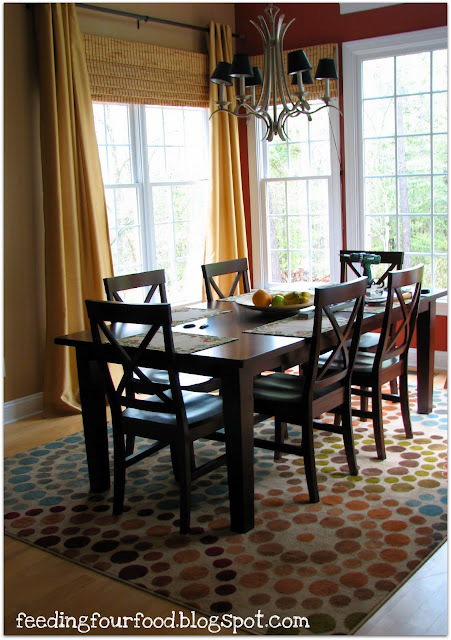 Here's another view of the other side of the dining room that's open to the living room. The place mats were a steal from World Market for less than $2 a piece. And I liked the curtains so much that I ordered some for my living room too. This project is almost complete, and I'm happy with how it's turning out. We still need to lower the chandelier and decide between two head chairs for the dining room table and a buffet serving table. I know, a tough life I lead. As I have confessed in the past, a green thumb I do not have. Or as Yoda might say, "A green thumb have I not." Actually his thumbs probably are green. Anywho...the point is I can't grow stuff. Except herbs. Which are green. Darn it, I'm getting off track. This year, instead of deluding myself into believing that any of the vegetables I grow will produce edible fruit I joined something called The Produce Box. Some friends in my MOPS group work for this company and got me interested. 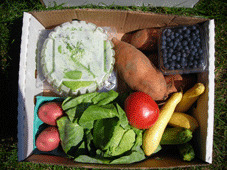 Basically, for a set fee, they deliver to your door a box of locally grown, fresh produce as often as up to once a week. I am very excited about this company. First of all, you know how much I love online shopping, and fresh produce delivered to your door? How cool is that? We also get to support a local family, since most of the deliverers are at-home parents looking to earn a little extra cash, and local small farms. And my family gets access to the freshest produce without me having to drive to the farmer's market each week...or try to grow it. 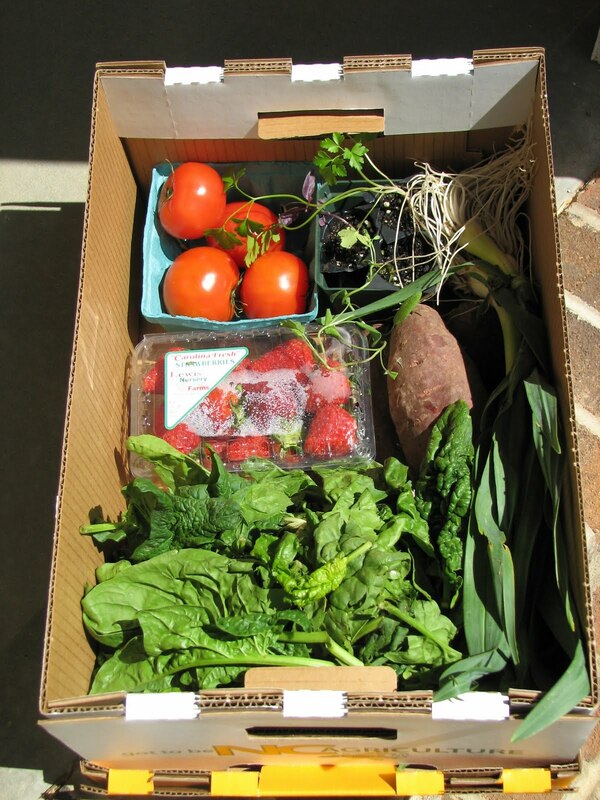 Our first box arrives the week of April 13th, and the owners have promised an assortment of fingerling potatoes, hot house tomatoes, swiss chard, strawberries, spinach, sweet potatoes and more this month. So stay tuned; I'll post pictures and recipes as the boxes arrive. Check out The Produce Box to see if they deliver to your neighborhood/town. If you're in Charlotte or Winston Salem areas check out The Farm Table. 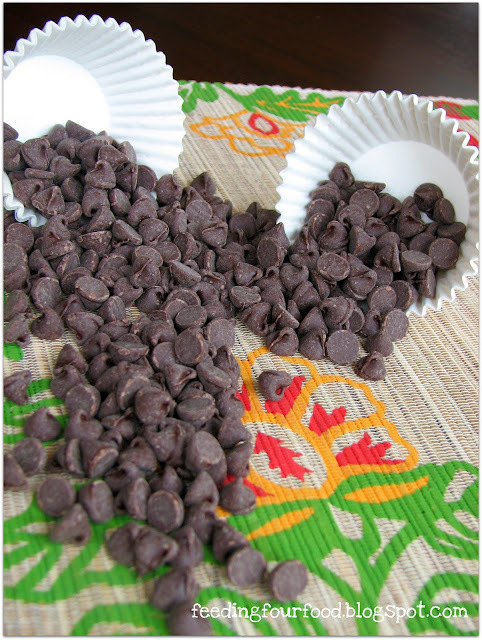 Sometimes inspiration for baking comes in simple forms, like paper muffin cups and half a bag of bittersweet chocolate chips. Oh, and a bowl of past-their-prime bananas. Banana bread is the PB&J of sweet breads. It reminds me of a cold winter day home from school with my Mom. Comfort food at its best. And since we had sleet this morning and a threat of snow (In March? In North Carolina? Who do I see about fixing this weather thing? 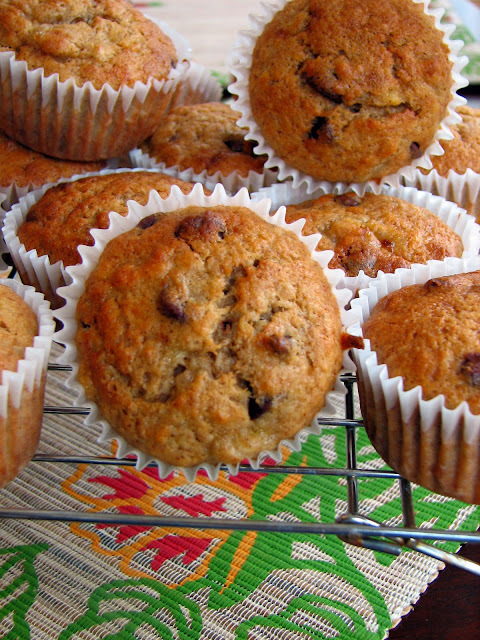 ), banana bread muffins will fit the bill. Mom always used to put chocolate chips in her bread, and I'm of the same persuasion. Ain't nothin' that can't be improved with chocolate. I also added brown sugar and cloves to this recipe from joyofbaking.com, took out the nuts since we didn't have any on hand, and put the batter in muffin cups. These freeze great and reheat easily for breakfasts in 30 seconds in the microwave. Use mini-chocolate chips and mini-muffin pans for a sweet treat for the kids. 1.) Since banana bread is such an old-fashioned treat, I decided to mix it up the old fashioned way--by hand. It's too easy to over mix sweet breads with an electric mixer anyway. Then it gets all tough and rubbery. So... mix all the dry ingredients in a large bowl, flour through chocolate chips. 2.) 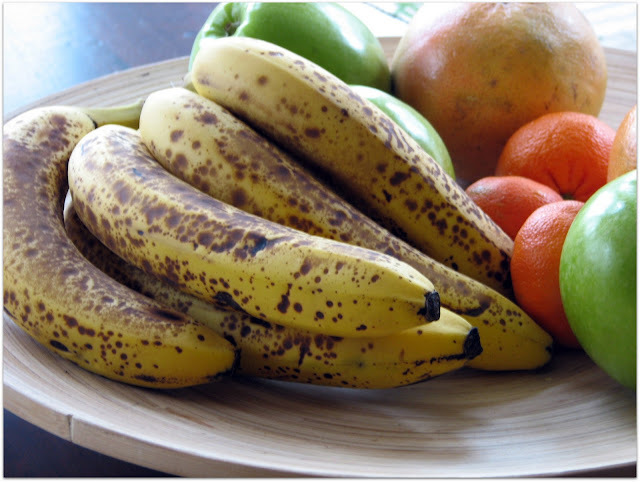 In a separate bowl, mash the bananas with the back of a fork and stir in the remaining wet ingredients until combined. 3.) 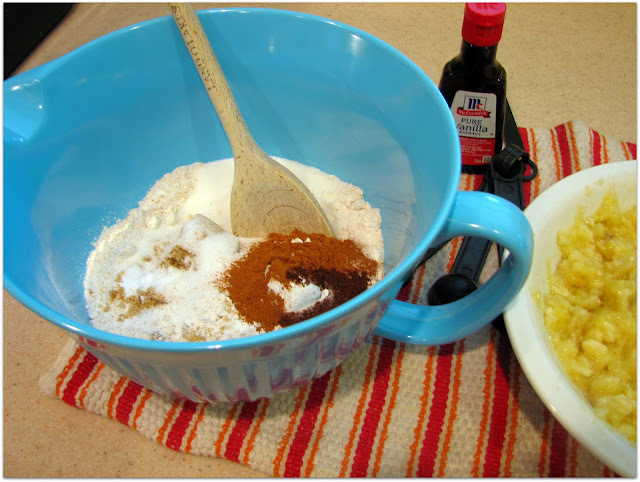 Make a well in the dry ingredients by pushing the mix up against the side of the bowl. 4.) Plop the wet ingredients into the bowl and stir slowly, gently, almost folding the wet ingredients into the dry. Some dry pockets might still remain. Resist the urge to keep stirring. 5.) 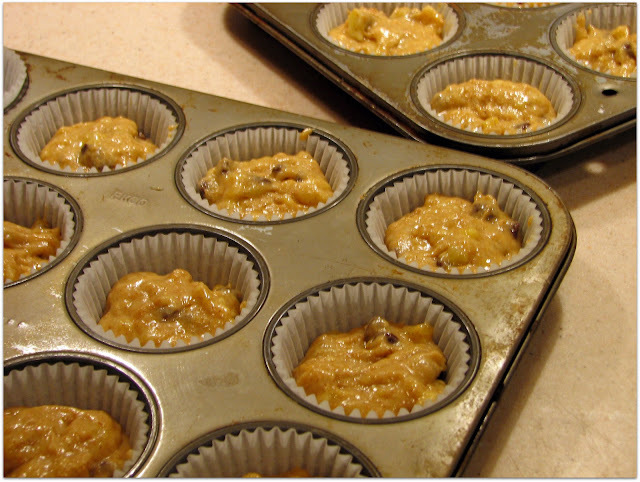 Using a 1/3 cup measuring cup, spoon batter evenly into 12 or so regular muffin cups. 6.) Bake in preheated oven at 350' for 20-25 minutes. Tops will be cracked and browned when done and no goo will come out if you insert a toothpick--not accounting for the chocolate chips of course. 7.) Let sit for a few minutes then tap out onto a rack to finish cooling. Step eight: devour. Call your mother. Repeat. 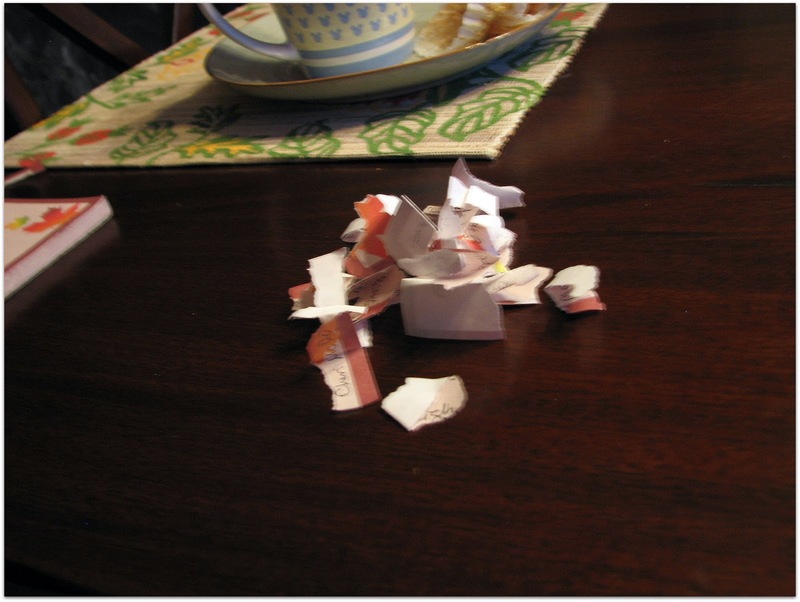 OK, first, before I announce the winner, I just have to show you my uber-technical sweepstakes drawing method. Very retro in a digital world. My handsome programmer husband would probably have a different approach, which would involve a spreadsheet and a bar chart (He says pie charts are only good for making people hungry. Mmmm, pie.). But as he was still sleeping when I took these photos this morning, my method will have to suffice. 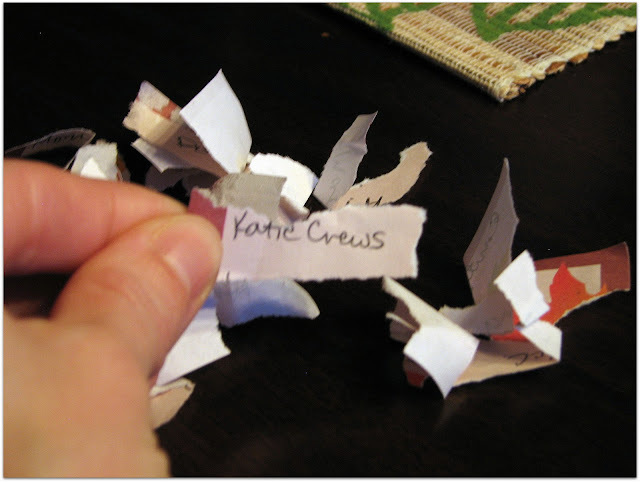 And so....the winner is...Katie Crews! Congratulations Katie and thanks for following Feeding Four! Yes, these photos are blurry. What do you want for 6:00 on a Saturday morning? Actually, it's not the time of day, it's my camera. I need to trade it in for a new one. But as I am currently in the process of spending my dining room decorating budget I don't want to rock the boat. At least not until my drapes arrive in the mail. 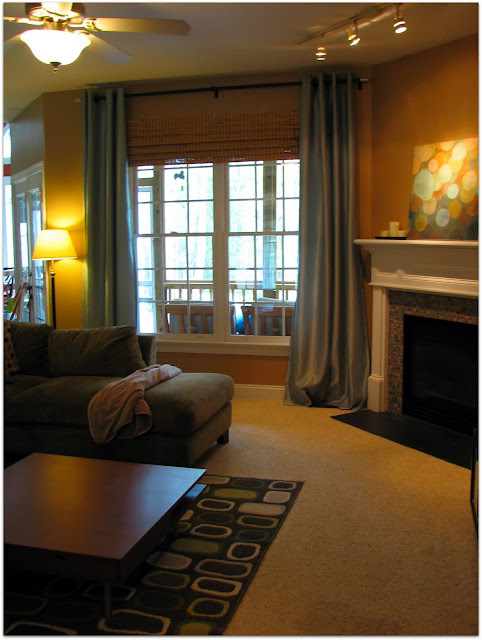 Yes, I ordered drapes! Anyway, not about me. About Katie and you beautiful followers. Enjoy Katie and thanks to all for subscribing and your comments. Keep 'em coming and feel free to throw in any requests or questions. I will probably not know the answer, but aren't those the best questions?